IBM Enterprise COBOL for z/OS is a leading-edge, z/OS-based compiler that helps you create and maintain mission-critical, line-of-business COBOL applications to execute on your z/OS systems. The reliability, availability and serviceability features are in the System Z's DNA. System Z is designed to provide an availability of 99.999% (five 9s). 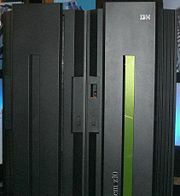 The "Z" in System Z's brand-name stands for zero down-time.System Z servers have reported an MTTF of 40 years. Organizations run their mission-critical applications on mainframe to provide 24/7 availability. I starten af 1960’erne havde de fleste mainframes endnu ikke et interaktivt interface – hulkort, hulstrimmel og magnetbånd blev anvendt til at transportere data og programmer. Disse fungerede gennem batch mode til at støtte op omkring back office funktioner såsom kunde fakturering, og samtidig støttede interaktive terminalers applikationer frem for programudvikling.